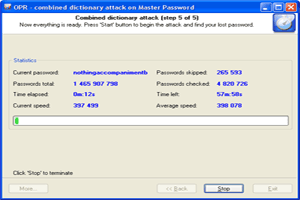 This type of attack on difficult and compound passwords is very similar to the simple dictionary attack, except that instead of using a single word for password verification here we use a combination of words or a phrase created by combining words from specified dictionaries. The purpose of the first group of the options is to set and choose the source material for our attack. For a start, we are to specify at least 2 dictionaries. To understand how the combined attack works, let's take a look at a couple of password generation examples that involve, in the first case, the same dictionary and in the second case - two different ones. 'ccc aaa', 'ccc bbb', 'ccc ccc'. 'ccc ddd', 'ccc eee', 'ccc fff'. 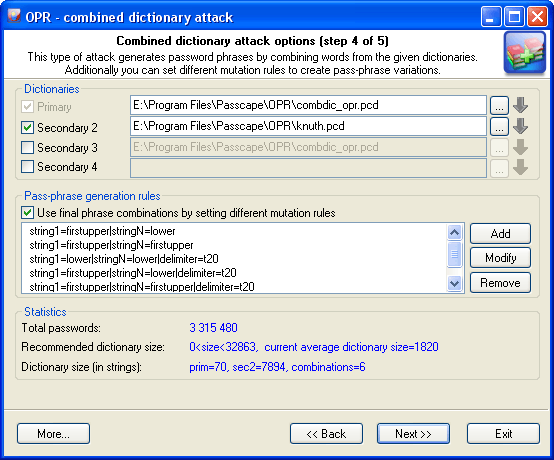 Perfect dictionaries for the combined passphrase attack are those that have different forms of words in them; e.g. jump, jumper, jumped, jumping. 'fff aaa, 'fff bbb', 'fff ccc'. Combined attack sets a certain limit to the number of dictionaries that can be used; that's not more than 4. Thus, the general limitation of this attack is that only password phrases of not more than 4 words can be recovered using this attack. Another essential drawback is the wide range of phrases generated. And, as the consequence, the proportional increase of the time spent on the validation of a password. Therefore, you should be careful when selecting the size of source dictionaries, especially for 3 and 4-word combinations. The next group of options is in charge of creating all possible combinations of phrases. 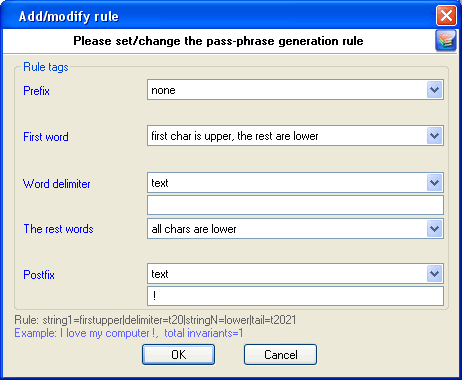 By default, if no password generation parameter based upon mutation rules is set, the program will create passwords by simply concatenating words from the source dictionaries, WITHOUT separating them with spaces. However, you can set your rules as well. For example, have it create phrases with spaces, begin words with caps, append numbers, etc. There are special rules available for this purpose; you don't have to know the syntax of them, for the mutation rule creation dialog is simple and intuitive. Prefix - text that will appear before each phrase. This element can be a character, plain text string, one digit between 0 and 9 or a number. For instance, if you set a one-digit prefix, the phrases created with this rules will look as follows: '0 aaa bbb', '1 aaa bbb' … '9 aaa bbb'. Word separator. It may be absent. Then all the words will be concatenated. Example: 'aaabbb', 'aaaccc','aaaddd', etc. You can otherwise set a custom separator; e.g. the '-' character: 'aaa-bbb', 'aaa-ccc','aaa-ddd'. 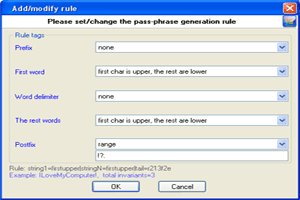 Naturally, the more mutation rules you set, the wider is the range of phrases you generate, and the more chances you get for the successful recovery of the original password. On the other hand, if the range is large enough, when searching through the entire range may take half an hour or more, the program will highlight the statistics text with red color. There's no reason to be afraid of that. Simply select one of the source dictionaries of a smaller size or decline from some mutation rules or, leave everything the way it is. The 'Statistics' group shows the average/recommended size of the dictionary, number of words in source dictionaries, total the number of passwords being generated, and other helpful information. 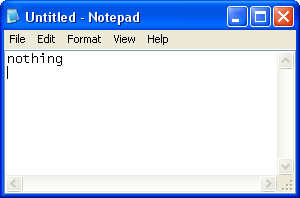 1 Create a text file with the only 'nothing' word in it. That will be our primary dictionary. 2 Select some general dictionary for the 1-st and 2-nd auxiliary dictionaries. For instance, the dictionary that comes with the program. 3 Set additional mutation rules. 4 Launch the combined attack and wait for the result. 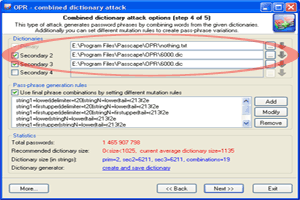 You can also download additional dictionary modules from the Passcape Software Web site.